Do something special for her on Valentine’s Day! 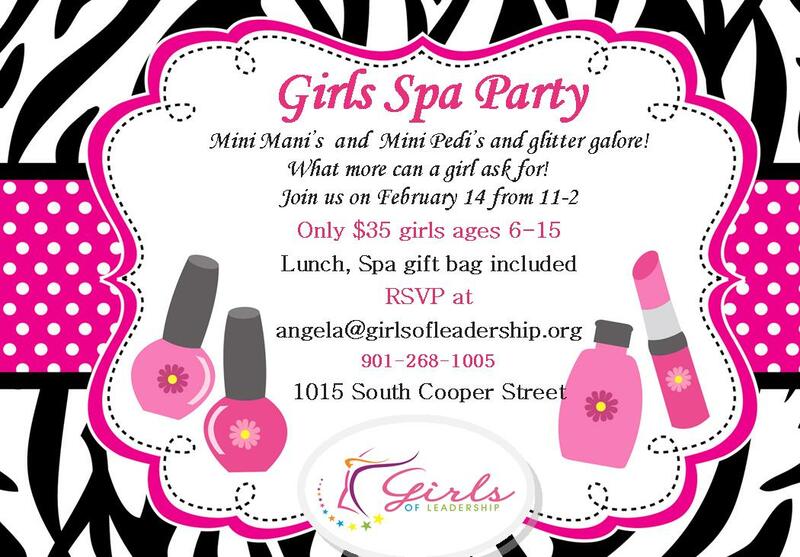 Girls of Leadership will be hosting a Girls Spa Party February 14, 2015. Drop off time is 11:00 and pick up time is 2:00. The pampering is for girls ages 6-15. Please RSVP to angela@girlsofleadership.org. Attached is more information. Four years ago, my first cousin, Jermaine Blake, was shot and killed in MY hood. Jermaine and I were a year apart, and, like most struggling black families then, we often lived in the same house, ran the same streets. He was more like a brother to me. As “saved” as I try to be, at that time, that part of my life was a blur. Trees looked differently, my conversations changed with my own children and conversations changed with my students. I became very transparent. I remember what the pastor of my youth, Rev. Melvin Lee (Macedonia M.B. Church, Hyde Park) preached at his funeral. He took notice of how SOOOOO many people showed up for the visitation, as well as the funeral. They just kept coming. It wasn’t that he was surprised that there was a lot of love being shown – hey, it was/is the hard part of North Memphis and we’re Blakes , but, Jermaine was only 30 when he died. So much life ahead of him. Rev. Lee said it was Jermaine’s fragrance that attracted so many people. His mother, Delilah Blake, gave him back to God as a child, so, his purpose was served. What fragrance are you leaving? No matter what the world thinks or knows or think it knows, what legacy are you establishing? What work will go on once you’re gone? Is it worth continuing? It is worth others being transparent because of what they are learning from you? Think about it. Agape is seeking a part-time applicant for the Siemer Connector position to provide client-driven and strength-based services to families who are in need of particular resources and assistance. This part-time position will require at least 20 hours per week. The Siemer Connector will possess a willingness to meet people where they are and build meaningful relationships, including the Powerlines Community Network apartment sites (Whitehaven and Hickory Hill). The Siemer Connector will facilitate the connection and engagement of clients to services needed (educational, mental health, substance abuse, workforce development, parenting/relational health) and other services provided through community agencies and resources). Bachelor Degree in Social Work or other related social services fields acceptable. Peer-based/community- based applicants with a High School degree or GED, with similar life experiences will be considered as well for this position. Candidate must be culturally sensitive with a passion for helping others. Must be computer literate. Must have a valid driver license and own a vehicle with proof of auto insurance. Candidate must be willing to engage in Agape’s Performance Quality and Improvement (also known as Continuous Quality Improvement) standards of quality & excellence.